The Gehölzgarten (tree and shrub garden) at Haus Ripshorst was designed by Lohhaus and Diekmann, landscape architects from Hannover. The garden shows the allocation of varieties of trees in a geohistorical context. 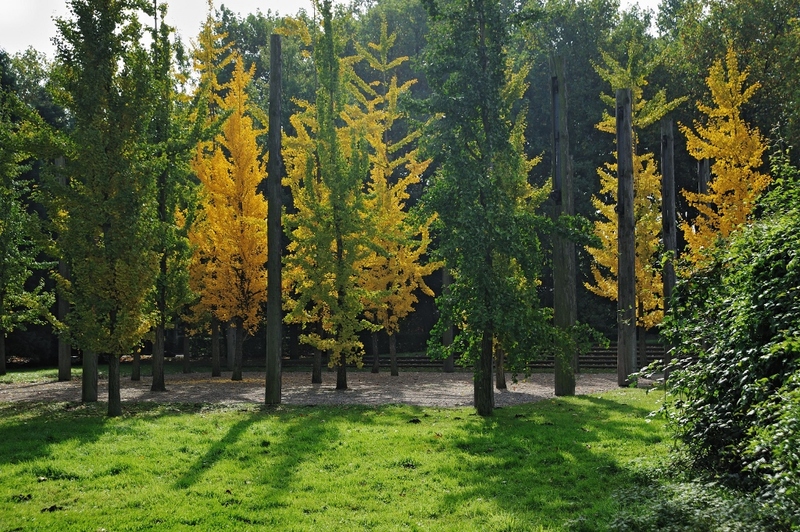 An expedition from “tertiary” to “cultured trees and shrubs” presents visitors with exotic beauties such as the tulip tree with its striking blossoms or the amber tree with its magnificent autumnal colours. A bold bridge designed by Prof. Dr. Schlaich from Stuttgart spans the Rhein-Herne canal with a steel tube arch, connecting Haus Ripshorst and the Gehölzgarten with the Emscherpark bicycle route. The Ruderalpark Frintrop borders on Gehölzgarten Ripshorst to the south. Here ruderal vegetation consisting of hardy pioneering plants has developed on a former marshalling yard. The “Klärpark Läppkes Mühlenbach“ was created to the east of Ripshorst on the site of the former settling basin “Läppkes Mühlenbach” according to plans drawn up by landscape architects Heimer and Herbstreit. Here, the Emschergenossenschaft (a regional water authority) as the owner succeeded in using the dominant industrial structures to create a novel form of landscape for the future. Since 1999, the buildings of the former farm Haus Ripshorst house the information centre for the Emscher Landschaftspark. An exhibition on the park shows well-known highlights alongside many smaller projects. A relic of the pre-industrial landscape has managed to survive for more than a century between collieries, blast furnaces, rolling mills and the arterial roads of heavy industry. This small idyllic area, which surrounds Haus Ripshorst and covers approximately 40 hectares, was used for farming in the midst of the highly industrialised core of the Ruhr area. For more than a century, the area belonged to the major industries. Then, in 1990, the association of local authorities in the Ruhr area purchased the grounds and integrated them into the Emscher Landschaftspark(Emscher Landscape Park). 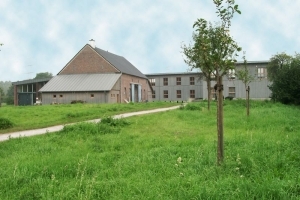 Here, as one of the first projects of the Internationale Bauausstellung Emscher Park (IBA 1989 – 1999) an information centre with a multimedia exhibition for the Emscher Landschaftspark was installed in the former farm buildings of Haus Ripshorst. The Gehölzgarten Ripshorst, a new form of a landscape park or arboretum to present trees and shrubs, now surrounds this centre. The information presented here on subjects such as industrial nature make the centre an ideal starting point for visiting the neighbouring parks known as ”Ruderalpark Frintrop“ and ”Klärpark Läppkes Mühlenbach“. The Gehölzgarten Ripshorst was designed by the landscape architects Irene Lohhaus und Martin Diekmann from Hanover. Their aim was not to create a stylishly designed park but primarily to preserve the character of the pre-industrial cultural landscape. Arable land with barley, oats and rye was turned into rambling grassland. A sixty-meter wide and nearly 2- kilometre long stretch of trees and shrubs closely follows the boundary of the settlement, illustrating the development of trees from the pre-ice age to the industrial age. Here visitors can learn about trees and shrubs as well as their forms, colours and fruits, their origins and their importance to mankind. Area I shows a tertiary forest which demonstrates the variety of trees and shrubs (approx. 150 different types of trees and shrubs) in central Europe in the tertiary age. Area II shows the pioneering stages of the post ice-age up to the time when reforestation started in central Europe. The trees and shrubs planted here are still considered to be pioneering plants (first colonisers) and can be used for landscaping spaces which feature extreme conditions such as slag heaps or industrial wasteland. Area III exhibits the individual development stages up to post ice-age reforestation. This development is a dynamic process which is determined by different locations and climates, finally resulting in particular vegetation in different areas. The examples shown here illustrate the various stages of forest development in central Europe ending up in beech forests. Area IV exhibits trees and shrubs which man has developed to meet his needs. These were created by selection, cultivation and by importing plants from other countries. An expedition from “tertiary” to “reforestation” after the ice-age to “cultured trees and shrubs” presents visitors with exotic beauties such as paulownia and the tulip tree with their striking blossoms, the American sweetgum (liquidambar styraciflua) and tupelo trees (nyssa sylvatica) with their magnificent autumnal colours and the red snake-bark maple (acer capillipes) with its interesting bark. Visitors can also admire the decorative fruits of various trees including ornamental apple trees. A bold bridge construction designed by Professor Dr. Schlaich from Stuttgart spans the Rhein-Herne canal with a steel tube arch, connecting the Gehölzgarten Ripshorst with the regional Emscherpark bicycle route. Walking in a southerly direction from Ripshorst garden, visitors come to Ruderalpark Frintrop. It is possible to enter the park from Ripshorster Strasse at several points. Ruderalpark Frintrop is one of 16 different exhibition locations on the Route Industrienatur (Route of Industrial Nature). The term “industrial nature” is used to denote plants, insects and animals which have established themselves on what were once highly industrialised areas. The industrial use of such areas changed the living conditions fundamentally. They include very diverse locations ranging from desert-like expanses of slag to lush jungle-like forests. A gloriously colourful abundance of flowers and bizarre, unique forms can be found here. In the 1960s, the Essen Frintrop marshalling yard became disused. Over the years, trains carrying goods such as coal, iron ore and lime lost parts of their loads. These substances and the crushed stones on the tracks in particular had completely changed the consistency of the soil and hence the water balance and microclimate of this 25-hectare area. Numerous parallel strips of vegetation consisting of robust pioneering plants such as willowherb, cleaver, buddleias and birch trees in groups developed along the former railway tracks. The designs drawn up by landscape architects Davids, Terfrüchte and Partners from Essen were used to develop the area carefully so that elements of landscape architecture merge with the contours of the former railway tracks and the dynamics of nature (succession). To the east, the numerous paths of the Gehölzgarten Ripshorst connect the grounds with the former water treatment plant “Läppkes Mühlenbach”, which belongs to the Emschergenossenschaft (responsible for water management in this area). This former water treatment works was once a technological plant erected with the all the harsh charm of the 1950s, but is today the location of a public park created by landscape architects Heimer and Herbstreit from Bochum. The centre of the park is formed by the former round settling basin, which is now a water-lily pond with characteristic vegetation around its edges. Ornamental Japanese cherry trees mark the entrances to the water treatment park and the points where it meets the adjoining Gehölzgarten. The main areas within the park are planted with red-blossomed chestnut trees in grove-like arrangements. The buildings of the former technological plant were converted into an interestingly designed architectural ensemble which now houses the Garten- und Landschaftsbauverband NRW (Garden and Landscape Builders Association of North-Rhine Westphalia). The many paths and benches invite the visitor to wander and linger for a while. The former digestion tower has been transformed into a work of art which is combined with a sound installation to create a successful interpretation of nature-industry. Tuesday – Sunday and on Public Holidays: 10 a.m. – 6 p.m.
Tuesday – Sunday and on Public Holidays: 10 a.m. – 5 p.m.
No admission fee to park and visitor centre.